The life and work of Ignaz Semmelweis is among the most engaging and moving stories in the history of science. 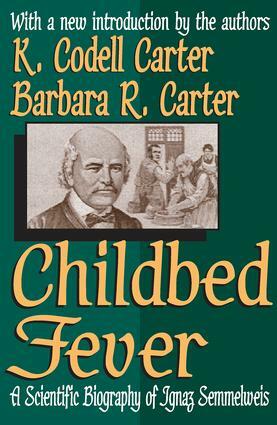 Childbed Fever makes the Semmelweis story available to a general audience, while placing his life, and his discovery, in the context of his times. In 1846 Vienna, as what would now be called a head resident of obstetrics, Semmelweis confronted the terrible reality of childbed fever, which killed prodigious numbers of women throughout Europe and America. In May 1847 Semmelweis was struck by the realization that, in his clinic, these women had probably been infected by the decaying remains of human tissue. He believed that infection occurred because medical personnel did not wash their hands thoroughly after conducting autopsies in the morgue. He immediately began requiring everyone working in his clinic to wash their hands in a chlorine solution. The mortality rate fell to about one percent. While everyone at the time rejected his account of the cause of the disease because his theory was fundamentally inconsistent with existing medical beliefs about how diseases were transmitted, in time Semmelweis was proven to be correct. His work led to the adoption of a new way of thinking about disease, thus helping to create an entirely new theory - the etiological standpoint - that still dominates medicine today.